Got a spare shoebox lying around? This is a fantastic upcycled project for modern day families running over with gadgets needing power. 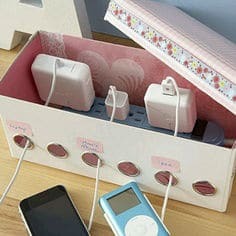 Cover it with printed contact or wrapping paper and turn it into a stylish, upcycled charging station!! Check out the full tutorial including tips on how to gift wrap (in case that is something you’d like to work on) over at Every Day Family blog. Send us a photo if you make one, we’d love to see it!